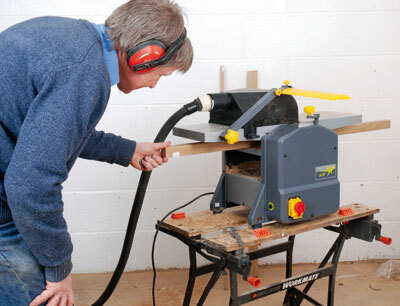 The trouble with planer thicknessers is they are expensive and space consuming. 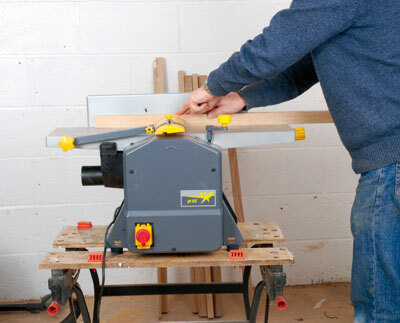 For the garage woodworker, a benchtop model at under Â£200 would therefore seem like a godsend - provided it can deliver the goods. 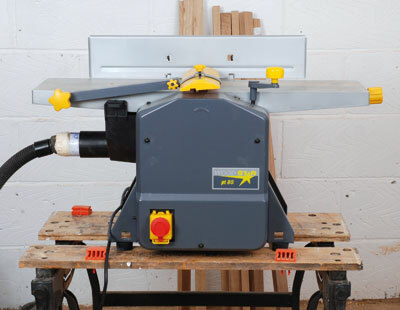 I used it to prepare oak picture frames which had to match an existing mitre-cornered profile. After dimensioning my metre-long pieces roughly on a circular saw, I positioned the fence and dust extraction and set to. It took a couple of hours and a lot of concentration, but I got the results I wanted and the frames met the wifely standard. Ear protection is necessary for prolonged use as the brush motor produces a loud whine. The quality of the finish was good provided I took care to make fine finishing cuts. In thicknessing mode the scale set by a rotating handle on top of the machine proved sufficiently accurate up to the final skim-cut finish. Chip extraction was good, despite my slightly makeshift arrangement using the end of a plastic bottle as an adaptor. In thicknessing mode some chips escape, but they are easy to vacuum up. Safety switching is via a slider microswitch in the dust extraction hood and the cutterblock guarding is robust and simple to position. The adjustable fence assembly is adequate. For its price and size this is a really useful machine. To get consistent results care is needed, but the finish is good and the size of timber it will cope with is probably adequate for hobby woodworkers. It fits nicely on top of a Workmate. "For its price and size this is a really useful machine"